DNA errors and new mutations in the melanin-producing cells – melanocytes – give rise to a tumor called melanoma. The most frequent cause for this malignancy is excessive exposure to ultraviolet radiation while sunbathing or indoor tanning. The other risk factors include heredity, light skin type, high amount of moles on the body (over 50) and immunosuppresion. The latter is mostly caused by HIV or by immunosuppressive medications. In the last century the number of skin cancer is increasing. Maybe this is because the beauty standards are changing ? Earlier in the days pale skin was associated with royalty and higher status. People that worked in the fields more often had tanned skin. On the other hand were the nobles that didn‘t have to go outside and work for a living. Therefore, they received less UV overexposure and had fair-skin. Interestingly, some places like the majority of Asia (particularly Thailand) still consider pale skin as a beauty ideal. It is worth remembering that even such a simple thing like a sunscreen can, literally, be lifesaving. Some sources claim that UV protection could reduce the risk of skin cancer at least 50 %. To our surprise, melanoma accounts only for 5 % of all skin cancers. However, it is responsible for at least 75 % deaths related to the malignancies of the skin. No wonder why such a relatively rare cancer is so known. Why melanoma is so vicious? This is perhaps due to the fact that this type of cancer is more aggressive and invasive than its other counterparts. For example, people with basalioma can live for decades until the tumour causes life-threatening complications. Melanoma, however, is a different story. For that reason, it is important to recognize as well as understand this malignant growth and to react accordingly. A – Asymmetry. One side of the mole differs significantly from the other side. B – Borders. The borders of a possible melanoma can be irregular, unclear, scalloped, notched and uneven. C – Color. A questionable mole can be unevenly colored and have different shades. There can be variations of white, grey, black, pink and blue. • Ulceration can also develop and be a sign of melanoma. Redness, swelling and pigmentation are possible signs that should raise a concern. • Bleeding and fluid excretion of a mole and its surroundings are also alarming signs. • The mole can become itchy and painful. Lesions and scabs can start forming. In this case get a skin check at a dermatologist or another specialized doctor. Regularly check your body surface and apply the ABCDE rule. Regular skin checks and follow-up appointments. If you have risk factors or had melanoma – booking at least one visit to the doctor‘s office a year could be a great investment. The best prevention is to have a suspicious mole checked and removed if needed. Questionable moles are examined with a dermatoscope and other tools. Melanoma is confirmed when a skin biopsy is done. If there are speculations that the cancer has spread, the sentinel lymph nodes are checked. CT, MRI or PET scans can also be performed to get a complete systemic image. 87 000 new melanoma cases in USA every year. Melanoma accounts for 5 % of all new diagnosed cancers every year. The average age when melanoma appeared – 50 - 55 years. The lowest prevalence of melanoma is in the 20 – 34 year group (6% of all cases). Depends on the stage of the cancer. A melanoma that has not spread is removed surgically. A melanoma that has spread to the lymph nodes – the tumor is removed surgically + the removal of sentinel lymph nodes + systemic treatment. Advanced melanoma (metastatic) is treated systemically with interferon, chemotherapy, medications that block signal molecule, angiogenesis inhibitors, immunotherapy. The majority of the systemic treatment options can cause side effects, the effectiveness greatly depends on the genetics of the individual. The earlier melanoma is caught and removed surgically – the better the outcome. Early stages of melanoma have an almost 100 % cure guarantee. Advanced melanoma has a poorer outcome, it can be improved with the help of systemic treatment (including Sodium dichloroacetate). It goes without saying that melanoma can cause a lot of fear and stress. Therefore, a good sunscreen and regular annual skin checks at the doctor can save a big load of trouble in the future. If you belong to a risk group – you have a fair skin tone, more than 50 moles, someone in your family tree had melanoma, you take immunosuppressive drugs regularly or had serious sunburns in your life – please develop a habit to examine your skin regularly every month or so. This way you can notice suspicious moles. Afterwards the dermatologist can take pictures of them and follow their changes if needed. If you do find a cancerous mole, it can be removed as soon as possible and cause no further tension. As with the majority of cancer cases, time is of the essence with melanoma. The sooner it‘s noticed – the better the outcome. Moreover, melanoma can be simply noticed with the help of self-examination in front of the mirror. This makes it one of the most easily and early noticed tumors there is. In many instances, one can spot melanoma without the help of a doctor. Subsequently, early stage melanoma can be quite easily cured with the help of a surgeon‘s scalpel. Sometimes it is also necessary to remove the nearby sentinel lymph nodes. In these cases radiotherapy and adjuvant chemotherapy can be used additionally for improved results. However, some forms of the tumor can advance faster and become late-stage melanomas. In such circumstances a local surgical excision and radiotherapy can be of no use. This is when systematic treatment comes in handy to reach the spread out tumor cells in the lymph nodes or other distant parts of the body. What we described are the main treatment options prescribed by doctors in ordinary clinical settings. Naturally, there are other additional ways that may help stabilize or shrink the tumors. With this in mind, let‘s look at the other two options available widely for people with cancer – the ketogenic diet and the metabolic cancer therapy. The basis of the ketogenic diet is to consume lots of fats, a medium quantity of protein (about 1,2 g/kg or 0,45 g/lb) and a small amount of carbs. In this case, the body receives lower glucose volumes and as a result the ketone concentrations start rising. It is believed that cancer has a very active metabolism of glucose and some specific amino acids, therefore these nutrients are very important for the proliferation and growth of tumors. Likewise, it is clear that cancer consumes a lot more carbohydrates than the healthy tissues. 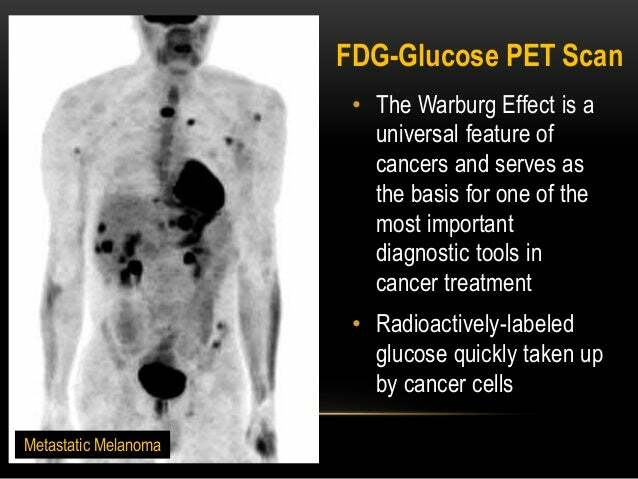 For that reason, when a PET scan is performed – the tumors glow. This is a perfect Warburg effect representation in real life. These changes happen when the cells become malignant. Apparently, the ketogenic diet makes the cancerous cells undernourished while the body starts using the ketone bodies as an alternative energy source. The result, as some believe, is suppressed tumor vascularization and increased cancer cell apoptosis, which is something that you would want to achieve when fighting against cancer. The ketogenic diet is becoming a popular addition to various anti-cancer regimens. However, it is important to stress out the fact that this dietary regimen could be harmful if done incorrectly. Truly, while there are surgical, medical or dietary methods to fight melanoma, one shouldn‘t forget another considerable option - metabolic therapy with dichloroacetate. The tiny molecule which exhibits selective cytostatic and cytotoxic effect on cancer cells. To our surprise, Sodium dichloroacetate also seems to be effective in the treatment of advanced melanoma. It appears to have the capacity to shrink tumors, stabilize the disease and to prevent the condition from worsening. All of which happened in this example with a man from Canada. We present a clinical case – BRAF-positive, III stage recurrent melanoma, which continuously came back after a handful of conventional oncological treatments. It all began in 2006 when this 32 year old fair-skinned man noticed a changing mole on his leg. The skin lesion looked like it should be checked out by a specialist. Little did he know that this small surprise would later on regularly come back every time it was treated. Bigger, meaner and more stubborn. The person visited the doctor and had a skin check. The dermatologist confirmed the lesion to be cancerous and soon afterwards it was removed by a surgeon‘s scalpel. The pathologists identified the excised skin tissue to be melanoma. Luckily, the disease hadn‘t spread to the nearby lymph nodes by then. There were no more suspicious moles. The year after the male noticed enlarged lymph nodes in his groin and new melanoma-like looking lesions on his left leg. It looked like the cancer had relapsed. Shortly, after a visit to the hospital the man was prescribed Interferon-Alpha and began systemic treatment. Thankfully, the results were not bad. The Interferon-α therapy lasted 9 months and it shrank the enlarged cancerous lymphoid tissue as well as the malignant melanoma on his leg. However, the treatment made the man feel sick, he couldn‘t bear the side-effects. Therefore, he stopped taking the medication. Till 2010 the man had no bigger complains regarding his health and lived on. Sadly, the cancer reappeared again. The male noticed new skin cancer lesions on his left leg, which were once again removed in a health care center surgically. Despite the efforts, at the end of 2011, the melanoma lesions recurred in the same place again. This time they grew on the scar tissue formed from the last surgical operation. At this point the surgeons decided to remove a broader area of the skin with the recurrent tumors and to perform a skin grafting operation. Unfortunately, at 2012 March the tumors reappeared in the new skin graft. The doctors tried to perform two more skin removal operations and skin grafting procedures, but it was no use. A skin biopsy of the left groin area lymph nodes was made. The biopsy confirmed the metastasis of BRAF-positive melanoma to this region. The man fought 6 years against this deadly disease, had at least 5 surgical operations and even took systemic treatment. Sadly, every year the skin cancer would renew itself and everything had to be started over again. • curcumin, • European mistletoe extract, • intravenous vitamin C.
Regardless of a hopeful and enthusiastic attempt, the vegan diet and the naturopathic therapy didn’t seem to work. After a couple of months CT and PET scans revealed that the cancerous tumors are growing and the lymph nodes in the inguinal region are getting bigger. Not only the cancer was spreading, but also an aching pain appeared in the area of the enlarged lymph nodes. Once the new test results appeared, the patient was diagnosed with disease progression. With this in mind the man decided to try out the DCA therapy, which recently had generated community interest in Canada. 2012 July, approximately 6 years after the diagnosis of cancer and various treatment approaches, the male once again decided to overcome his III stage melanoma. This time with the help of Sodium dichloroacetate. • 500 mg of DCA three times a day. • 500 mg of Acetyl L-Carnitine three times a day. He took this mixture for four years. During the time period, mild side effects appeared. He felt numbness and weakness in his hands and fingers at some point of the therapy, mild concentration disturbances have also been noted. However, it didn‘t take long till the adverse reactions disappeared. This most likely happened because of the administration scheme – 2 weeks on DCA + 1 week off DCA. Secondary responses weren‘t experienced later on. The man also performed regular blood tests to make sure that everything is okay. Even when administrating dichloroacetate for four years, the parameters continued to stay within normal ranges. The slightly decreased creatinine levels were already noticed before the DCA protocol, moreover, the modest changes weren‘t clinically significant. This example of blood work proves that when one takes Sodium dichloroacetate for longer periods of time, important toxic effects on the majority of organ systems don‘t seem to be evident. The results can be seen in the table below. ✓ The computerized tomography scan displayed that the previously enlarged cancerous lymph nodes significantly decreased in size in a relatively short time period (4 months). ✓ During the therapy no more new skin metastasis or lymph node growth appeared. Likewise, the cancer didn‘t spread to the brain, chest cavity, abdominal cavity or to the bones. ✓ The disease had regressed, an overall four year remission was achieved. The regular CT scans confirmed that no progression or metastization was evident. ✓ Through the 4 years of therapy, he felt quite good, was capable of working, did good at his job and could fully perform the tasks that he did before taking DCA. What followed after this time period ? After 4,5 years of taking this protocol not only did he started feeling increased work-related stress, but he also started missing his medications. At the time, he noticed a new enlarged left inguinal mass. At the end of 2016 ultrasound imaging as well as a PET scan was obtained and revealed that this was truly a regrowth of melanoma in the lymph nodes. The almost half of a decade remission was over and the disease recurred. Nevertheless, the man felt all right and didn‘t feel any remarkable symptoms. Afterwards he decided to try out other therapy. However, how did the new treatment go and how does he feel today, we have haven‘t yet discovered. On the whole, what we can learn from this clinical case ? A man with III stage BRAF-positive melanoma was treated with conventional methods for over 6 years, withstood 5 tumor-removal surgeries, took Interferon-Alpha and even tried taking natural folk remedies. Unfortunately, none of the above has helped him fully and the disease would return every year. Due to these remedies being unsuccessful, the male finally tried out Sodium dichloroacetate with other protective supplements. Fortunately, this helped him to achieve disease regression and stabilisation. The remission was confirmed with imaging tests. During the time period while he was on DCA, the functionality levels remained 0 based on the ECOG scale (fully active and without restriction). This means that his well being and the ability to work remained the same as it was before the therapy – he could fully take care of himself and carry on with his everyday tasks. It warms our heart so see that Sodium dichloroacetate could help malignant diseases regress and become stabilized or even fully healed with only minor adverse disturbances. As new clinical cases and clinical trials are on the way to uncover the therapeutic potential of this tiny, cheap molecule, we hope that this little bit of information will serve those in need well. Want to find out more about this report ? Please read the full clinical case, which was published by a Medical Doctor from Canada – Dr. A. Khan and other specialists. Added this to my regime and It has been better since. At start i tried powder but got a lil bit nausea. Changed to the capsule form, no more issues.